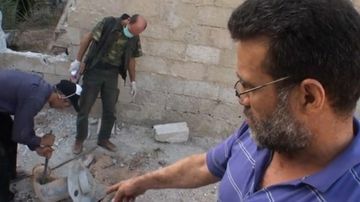 The central link between the chemical deaths of August 21 and the Syrian military is a certain model of rocket, allegedly fired by them in some number into the rebel-held districts. 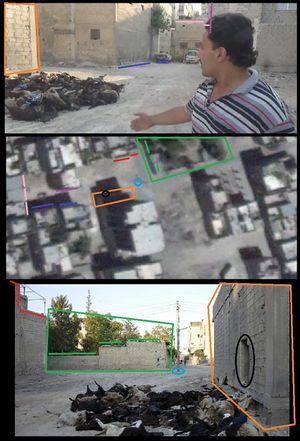 Dubbed by Eliot Higgins (aka Brown Moses) and others UMLACA (Unknown Munition Linked to Alleged Chemical Attacks), it has an unusual design with a fat tank with a 60-liter capacity in the middle, apparently made in Syria and unknown to arms experts. There are two variants, as Higgins reasonably describes: black-lettered for the high explosive version (dubbed UMLACA-HE), and a red numbered "unknown" (UMLACA-UK). 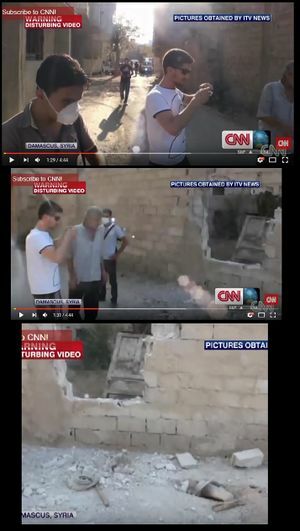 The latter are the type credited by local opposition as the delivery vehicle for unknown chemical agents, and two at least have tested positive for Sarin and/or by-products by the UN's investigative team. The possibility of the UMLACA's design for use as a fuel-air / thermobaric weapon is widely noted, presumably adapted to deliver Sarin instead. But there are some very strong signs they were used as a fuel-air explosive, in the exact instances that matter, where CW dispersal was alleged. These signs have been noted by some commentators but ignored or unduly downplayed by many more (like Higgins). Any such use would be fatal to the claims that they also dispersed the Sarin, vaporizing to oblivion any that was put there. That in turn would raise grave questions about how traces of Sarin turned up on the rockets, and inside local people brought forth by rocket-blaming rebels. I do not see the signs of two years of fighting. In fact I do not see any signs of fighting in the effected areas. There are no bullet holes or holes left by shrapnel. These collapsed walls are an oddity. Where we are starting to see fighting is by the main roads. 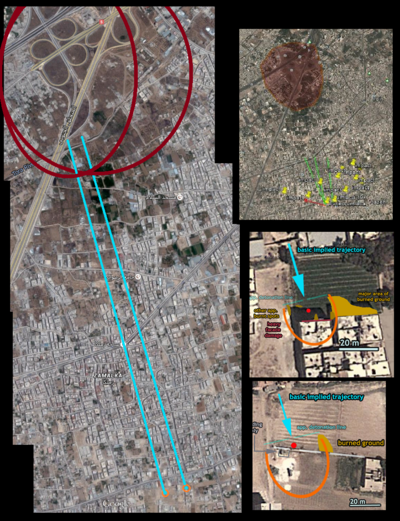 It you compare the two maps by Syrian Perspective, June 17 2013 and August 16 2013 you will note that all the main roads between the neighborhoods in Eastern Ghouta have become contested. It seems the the the thermobaric weapons are used to clear the road areas. What we see is the walls of buildings facing the road collapsing outwards. 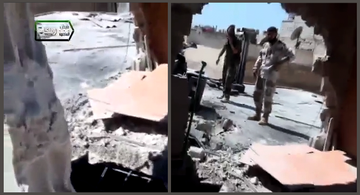 Here is a video, that shows the results of a thermobaric hit in Erbin. 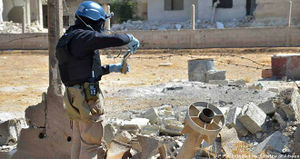 UN investigator collecting samples next to the remnants of a SAA thermobaric bunker buster rocket. 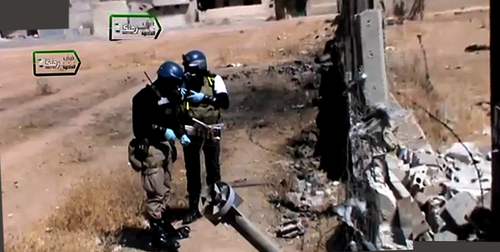 Note the blast damage to the wall in the background. Large numbers of victims have been reported, and the following pictures have been posted online claiming to show two of the munitions used in the attack. 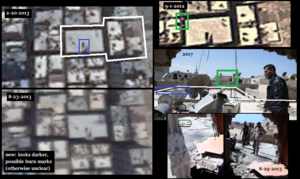 What's extremely interesting about these devices is they match with devices previously recorded in the conflict, reportedly launched by government forces, with it's first appearance in Daraya, south-west Damascus on January 4th. 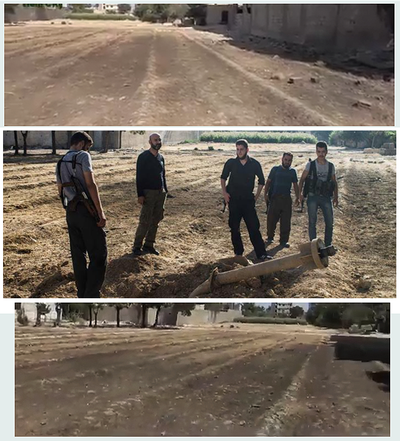 Brown Moses has found his smoking gun, a video of his "Mystery Rocket" being launched by what look like a Republican Guard unit. 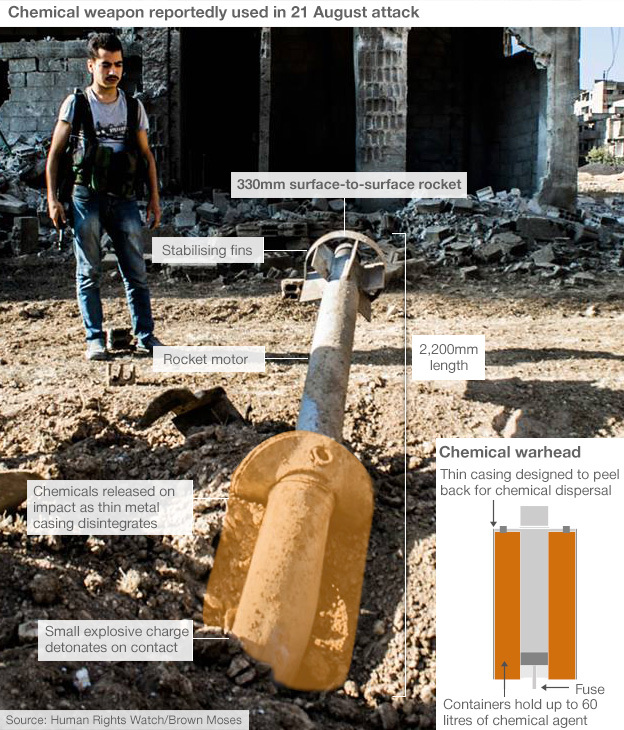 How do we know these are chemical weapons? That's the thing, we don't. As I've said all along these are munitions linked to alleged chemical attacks, not chemical munitions used in chemical attacks. It's ultimately up to the UN to confirm if chemical weapons were used, and if that's the case then it seems only the munitions above have been linked to the attacks. One of the few things we can be sure of is it's not a persistent agent, otherwise the people filming and photographing these munitions would be long dead. There's been some discussion about whether or not these are FAE (fuel-air explosive) munitions, but ultimately it's up to the UN to confirm the use of chemical munitions. 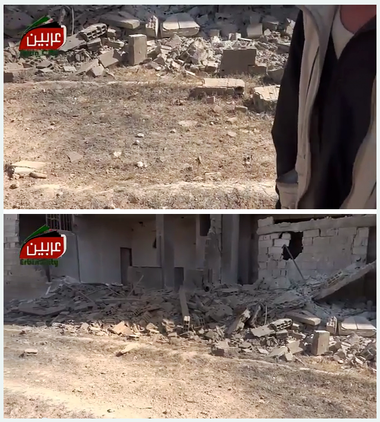 Blast damage in Erbin, maybe Zamalka. This could be caused by thermobaric bombs targeting underground tunnels between two neighborhoods. Note how the "vacuum bomb" has pulled out the walls without even moving the furniture. This disciple of Brown Moses speculates that the weapon used is a thermobaric weapon. This is an image of a flying FAE device just after dispersal of the fuel and just before the detonaton. There is no tunnel effect. It is interesting that the building was damaged but the wall survived. Then again, the only building left standing in Hiroshima is the one at ground zero. Of special interest here is both the nature of the damage to the adjacent buildings, and first, on the heat damage to the ground. Below, images of that, again far more visible to the left/east side of impact. From the second video you can see what happened; the rocket came from the northwest (note shadows), hit the ground and folded over. The tail fin section impacted the wall and knocked the hole in it. Most likely you would find the rocket engine on the other side of the wall. I didn't realize this was even a rocket impact site, but there apparently was one where the dead sheep are piled and partly burned. Chris Kabusk located this back in 2013, as shown here. (ignore the attached "impact site #2: - he admits that was a mistake). Using a little-seen photo he used, I verified site details as shown. We see a hole in the ground, rocket removed, some scraps of metal around, and to the south, a hole in the north wall of this building. 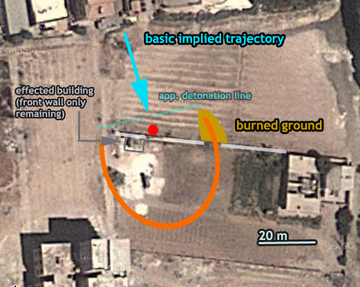 It's suggested this rocket came in steeply from the north or northwest (still ironing this out, but it seems more northwest than either Kabusk or I thought), dug in and bent forward, and had its tail end come loose and fly through that wall, as it seemed with the dud scene above. First a man say on 28/8 but got interrupted by the second speaker which appears to be the camera man :in the night of 21/8 at 2 O'clock after midnight, Bashar Al Assad fired 3 missiles at us from mount Qasion The rockets had a sound like a whistle the first one fell here, the second one at the way to Zamalka and the Third one at the way to Ein Tarma, the distance between them is about 150 meters. Here is the rocket we filmed a little time ago. It caused the death of 35 men and children they are all disabled. Even the grass and plants were not safe. The land was green and the chemicals burn for 40 meters and now I will show you the burned grass. Even birds got killed. The smell of chemicals spread 300 meters × 4 sides, I mean 300 meters in all directions, that equals 1200 square meter, and there is a dead bird. The CBU-72 consisted of three fuel-air explosive (FAE) submunitions. Each submunition weighed about 100 pounds and dispensed a cloud approximately 60 feet in diameter and 8 feet thick composed of its 75 pounds of ethylene oxide aerosol fuel across the target area, with air-burst fusing set for 30 feet. An embedded detonator ignited the cloud as it descended to the ground to produce a massive explosion. "... Damage from a deflagration tends to be more severe away from the ignition point, as the reaction energy grows with the expanding reaction (flame) front. It is for this reason that identification of an ignition source and mechanism for a deflagration may be more difficult than for a detonation." 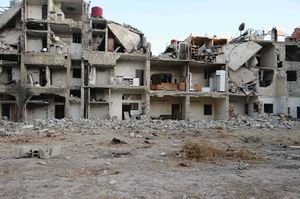 (this page should be mostly about the Ghouta attack connection, but there is at least a bit of relevant side-information, especially about one year ago and in the north. There's even some both sides accusing each other involved. Syrian opposition sources claim that the Assad regime used "mass-killing thermobaric weapons" on civilians in Aleppo, in northern Syria, the UK's Times reported on Friday. “We haven’t seen these kinds of bombs until recently,” a source said. The sources said fuel-air bombs were being fired from ground-based rocket launchers and helicopters. They said the widest use of the bombs took place in Aleppo earlier this month. 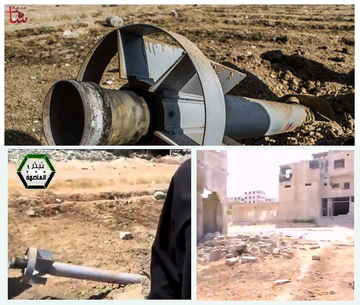 The thermobaric weapons were believed to have been supplied to Syria by Russia. Israeli sources said some of these munitions had been transferred to the Iranian-sponsored Hizbullah in neighboring Lebanon. 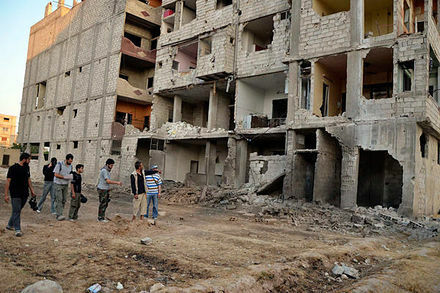 This attack takes place although the Syrian regime pledged not to target schools and universities. 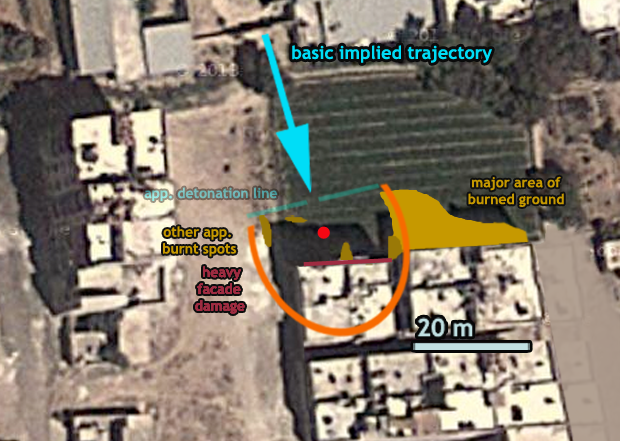 Too large, CW needs to be dispersed over a large area, usually done with cluster munition. The 500kg warhead would be overkill, just like the 100MT Tsar Bomba. Part of siege engine, used against underground tunnels. Range would not be enough for other use. Rocket fragments seen are not from August 21. This page was last edited on 14 August 2017, at 15:00.